The Durmitor National Park holds a mountain range with high peaks and glacial lakes, and the bordering Tara River Canyon. 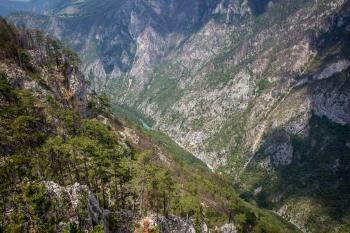 At 82 km long and 1,300 m deep, this canyon is the deepest in Europe and one of the major canyons of the world. Because of the karst formation there can be found over 200 caves. 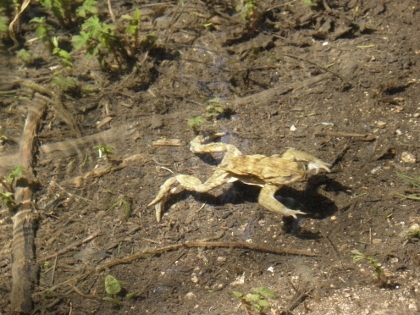 The most notable of all is the Ledina Pecina, at 2.100 Meters at Globa Glava. The cave is famous for his frozen stalagmites that can grow up to 3 meters. Notable fauna includes the brown bear, wolf and various species of eagle. The Park contains one of the last virgin forests of very old, tall black pine (Pinus nigra) in Europe. 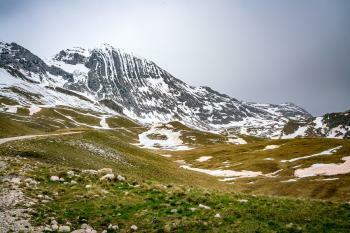 I visited Durmitor NP from the town of Zabljak, a ski resort in winter and a quiet but pleasant holiday retreat in May. From my hotel I could walk right into the park, so I was out there already before 8.30 a.m. Some of the best views I had from the parking lot of the hotel: there's a panorama of the whole mountain range to be seen, with peaks covered in snow and thick forest beneath. The Tourist Information (where at least one girl speaks excellent English) had told me the day before that I did not need a map to do the easy hikes. So I started where everybody starts, at the Black Lake (Crno Jezero). Entering the park this way, you also pass the ticket booth where a 3 EUR fee is collected. The only other people I encountered where locals walking their dog or excercising. Normally you can do a full circle walk around this lake, but the path was blocked half way because of flooding. After that I walked on to the next glacier lake, Zminje Jezero. It takes about an hour on a path through the forest. It is signposted well, with red-and-white marks on the trees. I had seen patches of snow here and there along the way, but at the final hundreds of meters the path was almost fully covered with old snow. You had to just walk on it. Fortunately a pleasant surprise was waiting at the end of the trail: a pretty lake with a bench in the sun on its shore. I sat down for a while, was greeted by lots of frogs that inhabit the lake and met a local man with his 2 children who tried to catch fish at the lake. I walked back to Zabljak via a different route, along some farms and the village of Pitomine. In all it was a pleasant and not too tiring walk of 4.5 hours. Most of the other hikes in the area are in the difficult category, and will take you right up the mountains. The mountain scenery I found the best part of the visit – it’s just like the Alps in Germany or Austria, but still good. I did not encounter any exciting flora or fauna species, so in combination with the very “planned” feel of the park it’s all a bit tame. A fantastic natural site to explore and spend some time in a different part of Montenegro. The town of Zabljak, relaxed and rambling, is the centre of tourist activities in Durmitor National Park. It’s an alpine centre – designed primarily for skiing in winter time but adaptable for summer activities. At this time of year it’s a popular place for hiking, climbing, rafting and bird watching. Cool and crisp, in contrast to the Montenegrin coast a couple of hours drive away, it escapes the oppression of the Balkans summer heat. 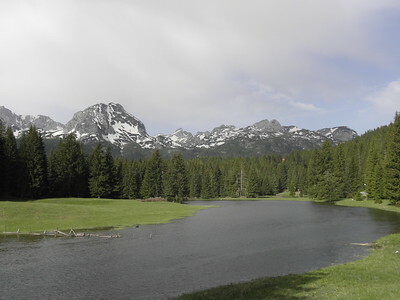 Other than Tara Canyon, one of the most popular parts of the park near Zabljak is Crno Lake (or Black Lake in English). It is the best known of the 18 glacial lakes and is an easy walk from town. It’s used for camping and sports activities or as a base for hikes into the mountains. I visited Durmitor National Park in April 2016. I drove there from Sarajevo, which is the hard way to get there. The road is very windy, going up and down mountains the entire time. Also, I found out the hard way, that they do not plow snow in the park until the May. There was a massive snow drift covering the road about a kilometer into the park and I couldn't drive any further. Read more about Durmitor National Park on my website. I visited this WHS in April 2014. I stayed in Zabljak which is a ski resort in Winter and a quiet verdant town in the other months, just a few steps away from the entrance to the Durmitor National Park and about 700 metres away from the glacial lake, Crno Jezero. The Black Lake is really a sight to behold at 1416m above sea level. I woke up early in the morning and at 7.30am I was the only soul to be seen around. I spotted some rare birds, a few squirrels, mice and some frogs in the tranquil lake. The trail around the Black Lake is relatively easy although the best view in my opinion is the one you see as soon as you arrive from the National Park Entrance. There are a few informative boards describing the flora, fauna and natural importance of this site. Bring good hiking shoes and a digital camera and enjoy nature as it should be. Next to the Black Lake is yet another lake but it seemed less interesting than the picturesque Crno Jezero perhaps because of the morning mist that started to form. On my way back to the hotel, I met the park ranger that had arrived in the meantime and I was able to pay the 4 euro entrance fee before exiting. A few kilometres away, by car, there is the Tara Gorge which deserves a visit too, especially if you're into water adventures such as rafting. This is a great European natural WHS and I would recommend it to anyone! 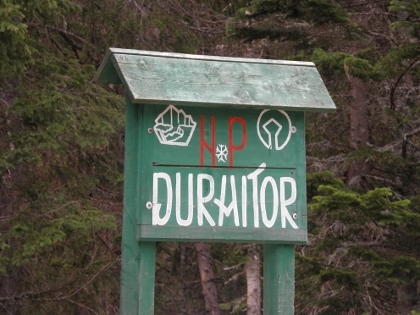 Durmitor seems to be one of those sites that were inscribed early on, but would have a somewhat harder time achieving inscription today. I did not visit the main part of the national park around its namesake mountain (only saw it from a distance), but did see the quite impressive Tara River Gorge (part of the national park), which is supposed to be the deepest gorge in Europe. As it was raining, I did not do any hiking, which would probably be necessary to fully appreciate everything the park has to offer. In general, I would say that a visit to the park, especially the gorge, makes a nice excursion and is a good distraction from the tourist resorts along the Montenegrin coast. The WH value is not that apparent, but as there are not really many natural sites in Europe, I suppose the inscription is justified because of its flora and the glacier and karst features. Serbia and Montenegro are probably not figuring highly in people’s travel plans yet, even some years after the end of hostilities. We last went there when it was part of Yugoslavia and the civil war and troubles in Kosovo were all in the future. In any case the WHS of Durmitor is, I suspect, likely to be relatively unknown to most travellers – its presence on the list is justified by its geology and, straddling as it does, both Mediterranean and Alpine climates, it apparently contains an “exceptional range of species”. Much of this is likely to go unknown and unseen by the casual visitor. The scenery is pleasant but not outstanding in World or even European terms. 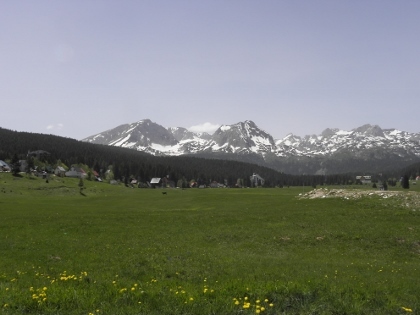 There are some snow capped mountains (or at least they were in early June) up to that of Durmitor itself at 2523 metres (and a winter ski resort at Zabljak), a number of lakes, meadows, forests and deep valleys. In fact the valley of the River Tara is claimed (at between 1000 and 1300 metres) to be the deepest gorge in Europe (I don’t know how they calculate this but there are a number of other claimants – eg Verdun in France, Samaria in Crete). This gorge lies outside the Durmitor National Park but within the boundaries of the inscribed area. Fine as it was I didn’t get an impression of a mighty canyon of continental proportions (photo) although the road North and South of the gorge which you will need to follow, at least in part, to reach Durmitor Park, fully justifies its green marking on maps showing that it is scenically striking. At the bottom it crosses an impressive concrete bridge which is still 135 metres above the river. The river was recently threatened with a hydro-electric dam planned with nearby Srpska (the Serb part of Bosnia) which would have flooded a significant part of the gorge and this threat was only removed as recently as April 2005 (just in time to avoid criticism in Durban??). Interestingly it was the government of the Republic of Montenegro (in which Durmitor is situated) which eventually decided against building the dam – a reminder that this site sits in a corner of unstable frontiers. Montenegro may yet vote for secession from its federation with Serbia, and Kosovo is not far away. Any Montenegran frontier with Serbia would lie on the plateau north of the Tara River (far side on photo). but, as a sightseeing destination in my opinion, it only just about justifies a detour if you are already in this corner of Former Yugoslavia and if you are mobile. Montenegro is an interesting destination in general and is well away from the normal tourist routes so if you like such places still close to W Europe it could be worth considering. The WHS of Kotor is just down the coast from Dubrovnik and the capital town of Cetinje and the mountain of Lovcen can be reached by a spectacular road over the mountains from Kotor. Glaciers: Debeli Namet Glacier on Šljeme. Considered the "southernmost but one" glacier in (Western? )Europe (the Southernmost is Calderone in the Appenines). Some argument as to whether it is a "Glacier" or a "snow slope". 88 Community Members have visited.